- Knowledgebase and more documentation should be uploaded online for easy fix. They offer a 30 days money back guarantee if you are not fully satisfied with the product you can claim your money back. They also offer trial, highly recommended low cost VPN. SaferVPN is an easy VPN service for every business professionals and individuals. As an IT pro, I have to travel to the different places and location for a client meeting and site visit and SaferVPN is the best way to access the internet protecting my identity. "Keep your privacy intact thanks to SaferVPN"
It has a nice and easy to use interface, what I like the most is that no matter the country or location you choose, the navigation speed remains constant and there are no annoying interruptions. The Android application retains its privacy and does not take up much memory space. In fact, I have not had problems so far with SaferVPN, anyone can use it to satisfy their privacy and protection needs. Total access to restrictions in your locality. It is ideal for streaming services and the best thing is that you can be in the network more safely thanks to the protection of your data and location. Nowadays, any company or person can collect information about us through the storage of our habits and preferences. SaferVPN helps us avoid being tracked by hiding our IP and our personal data. "SaferVPN - Network security is essential." SaferVPN provides high encryption standards like 256-bit encryption. They have servers all around the world, that guarantees you good connection everywhere you are. The company has a no-log policy, so you can feel certain that your DNS logs or browsing history remains a secret. Also, it's very easy to use. The interface is user-friendly and you don't need to have any experience to use it. There is a simple tutorial too. The speed isn't as fast as I would like to get for the price. Also the support is slow and I waited 2 days for an answer. I use SaferVPN, because I am sure that my privacy is their priority, and they don't keep my logs. It's very important when I share sensitive data or get access to a business mailbox. Also, I am into cryptocurrencies and I pay for the service this way, I like the fact that even the payment process is anonymous. "A great way to protect your privacy"
SaferVPN has different apps for the different kind of devices Android, Mac os iPhone and Windows. It also provide us many countries servers for connecting and browse very securely. The application chooses for you the server of the country you want to connect to, there should be a list of servers by country. Server up-time has never been an issue since we started using this service. SaferVPN has been useful at keeping data collectors at bay as well as accessing country restricted websites. The experience has been nothing but positive so far. 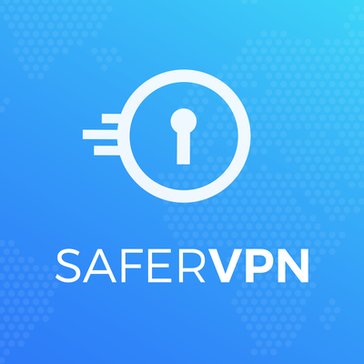 "SaferVPN - The Best VPN"
One of the main advantages of SaferVPN is its fast connections with unlimited bandwidth, so you can browse the web without losing speed. A wide range of connection protocols and AES-256 encryption across the entire range of services is also a plus. Compatibility with major platforms and an easy-to-use graphical interface is worth mentioning. While using this vpn I did not notice any flaw except for a short trial period. If you are looking for a solid vpn at fast speed you should consider buying SaferVPN. By using SaferVPN I can, safely use the Internet wherever I am and allow me to access content blocked by my IPS. "It really is a safer VPN"
My favorite thing about SaferVPN is the speed it connects. I don't usually have time to wait, and SaferVPN makes it easy for me to connect and get started on my overseas work. I love the level of security that it offers. I dislike the cost. There are several free alternatives that I could use. I have a small budget so it would be nice to have better deals. If you are looking for something that is very secure this is the right option. I am solving the issue of needing a private VPN to look for information I dont need tracked. "Great VPN at cheap price"
SaferVPN is a great VPN that I use most of the time. It is very easy to use and very fast, especially while using the browser extension. It works also on the mobile devices and the price is really nice and reliable. Sometimes the desktop app loses connection and I have to turn it on again. SaferVPN allows me to have a safer and a fast connection. "A good VPN for the price"
There is other vpn software on the market, but not for this price. This vpn is a better than average software for the price. At the moment i can not find any issues with this vpn software except the monthly upkeep of the product which is why i stopped using it. Lower the monthly price for small business users. This product has help me protect my computer from possible intrusion on the internet when surfing the web. SaferVPN protects users data from connected networks like Wi-Fi and hide users location and enable safe browsing. It provides access to blocked contents and help users to serve privately. Its available for mobile and web and function well with modern browsers. SaferVPN competitors provides same set of functionalities free of cost but it charges a little for your privacy. Used this for accessing blocked and unsafe content for official research purpose. "It helps me browse with any network either public without fear"
Hackers are everywhere sourcing for information. With Safer VPN, I can secure my browsing with speed. Safer VPN also provided me with 24hours free testing before I paid. The trial period is too short and sounds aggressive. It should be normal 7 days before subscribing to a plan but no, Safer won't do that. I wonder why. "Perfect VPN For date protection and privacy "
How easy it is to operate and use! The Pricing is great, and the app design is solid, this is the best of the VPN apps out there! "My experience was quite complicated "
I like that it gives you multiple options or locations to choose from . I disliked how long it actually took to create the Vpn and connect it to my servers . How to connect to multiple services quickly with ease . I'm always concerned about keeping my privacy while browsing internet and apps. SaferVPN is one of the good options out there that I have encountered. Other than that I'm pretty much happy with the service. "Average experience but probably good company"
* We monitor all SaferVPN reviews to prevent fraudulent reviews and keep review quality high. We do not post reviews by company employees or direct competitors. Validated reviews require the user to submit a screenshot of the product containing their user ID, in order to verify a user is an actual user of the product. Hi there! Are you looking to implement a solution like SaferVPN?